Machine made rugs have a rich history. The machine-made rug industry in the United States began in 1791 when William Sprague started the first woven rug mill in Philadelphia. Others opened during the early 1800s in New England. Included in that area was Beattie Manufacturing Company in Little Falls, New Jersey, a company that operated until 1979. In 1839, Erastus Bigelow permanently reshaped the industry with the invention of the power loom for weaving rugs. Bigelow's loom, which doubled rug production the first year after its creation and tripled it by 1850, is now part of the Smithsonian Institution's collections. He continued to devote his life to innovation -- 35 separate patents were issued to him between 1839 and 1876. Bigelow introduced the first broadloom carpet in 1877. Industrialist / retailer Marshall Field had a traditional Axminster weaving loom modified to create what no one else had ever created -- a machine-made rug woven through the back, just like a handmade Oriental, featuring intricate designs and virtually unlimited color variety. Karastan’s rug mill was established in 1926, and introduced the first Karastan rugs to the public in 1928. Machine made rugs have definitely come along way since then. There are many manufacturers today producing both simulations of antique designs and updated "oriental" type rugs as well as modern and contemporary styling by both weaving and tufting processes. Although there exists such diversity, the selections offered as well as the design flexibility allow for a wide marketability and as a result, there is virtually any style, size, color and pattern available today. Prices vary according to manufacturing process, yarn type, etc., but they typically all stay in the affordable range of most if not all consumers. 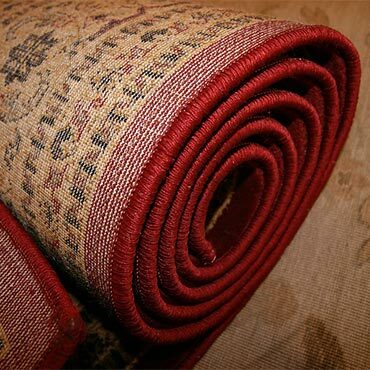 The durability of machine made rugs makes them very popular for families with children and pets. Solution dyed yarns are typically used in the manufacturing process, which means the colors are 'fast' and help them resist staining, fading, and make the care and cleaning of these rugs a cinch. They have a wear surface that is excellent, and are suitable for the high traffic areas of the home as well. Their portability allows you to be able to simply roll them up and move them easily to another room in your home, or to a new home altogether. If you need to store them for any length of time, make sure to do it in a climate controlled environment that controls moisture. If kept in a non-air conditioned garage for instance, the rug will mildew after a period and could result in permanent damage.